Are you a Saudi Aramco employee? Have there been any prior educational or therapeutic assessments? Please include the most recent date of diagnosis. Has the child received education/services outside of the Kingdom? If so, where? Once this form is submitted, an ACCEL representative will reach out to you regarding the next steps for your child. ACCEL International and Saudi Aramco are excited to announce the opening of the Ajyal Special Needs Center in September 2019. This center is the first of its kind in the Kingdom of Saudi Arabia and will provide high quality therapeutic and educational services to children with special needs. The center is located at the Ajyal Community in Dhahran and will operate initially with a capacity of approximately 60 children. Initially, the center will enroll young children between 3 to 12 years of age. Eligibility assessment will commence on May 19, 2019 to identify the first group for enrollment as well as to determine initial interest in related services for children with special needs. If you are interested in services for your child/children, please fill out the initial inquiry form at this link to start the assessment process. 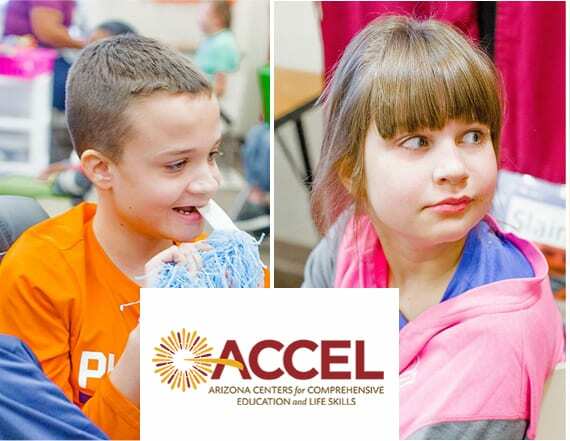 Arizona Center for Comprehensive Education and Life Skills (ACCEL) serves individuals with special needs, including developmental disabilities, autism spectrum disorder, intellectual disabilities, and behavioral disorders. Since 1980, ACCEL has given thousands of children and adults with special needs the opportunity to progress and flourish in safe and productive learning and work environments. ACCEL International is a private educational entity accredited by the National Commission for the Accreditation of Special Education Services and licensed by the Saudi Ministry of Education. Saudi Aramco is a leading producer of the energy and chemicals that drive global commerce and enhance the daily lives of people around the globe. They believe in the power of energy to transform lives, enhance communities, advance human progress, and sustain our planet. The center is located in the new Home Ownership Ajyal Community in South Dhahran. It will operate in September 2019. Children with developmental disabilities such as autism, learning disabilities, intellectual disability, multiple disability, speech and language delay. The age range is from 3 – 18 years for both genders. Diagnosis and assessment, early intervention, special education, therapeutic services including behavioral, speech, occupational, physical, and recreational, as well as vocational education. The objective of the programs is to support children’s transition to academic inclusion in regular schools, supported jobs, or independent living. The Arizona Centers for Comprehensive Education and Life Skills (ACCEL) based in Arizona, U.S. will be the operator. ACCEL is accredited by the National Commission for the Accreditation of Special Education Services (NCASES) and the center is licensed by the Saudi Ministry of Education. Primarily Arabic, a class for English learners may be opened in the future. Admission will be controlled and administered by the operator (ACCEL), not Saudi Aramco. Initially, the center will enroll young children who have developmental disabilities between 3 to 12 years of age. The operator will start with 60 students for the first operational year and increase enrollment gradually. The 60 students will be selected from among a group of applicants who will be evaluated from May-June. The selection will occur before the commencement of the operation in September. There is a tuition range set by the operator which varies in accordance with the severity of the individual and their service needs. The specific tuition category will be reported by the operator. Current Company policy for special needs compensation will apply. Please refer to the HR manual. There will be no transportation included, parents are responsible for student transportation. In addition, the operator will evaluate the needs of the children/families with regard to transportation services and may agree to provide the service if needed. Class size will vary from five to ten students depending on severity of need, behaviors, and physical size of the students. Student/teacher ratio will vary depending on the student functional level. The facility has a unique design in providing one-to-one rooms connected to the main classroom as well as group therapy rooms. The center accommodates 300 children. However, in order to deliver and maintain high quality programs and services to the children, enrolment will start with 60 students and will be increased gradually. Please fill out the inquiry form at the top of this page and the ACCEL International team will get you started. Key and lead personnel will be from the U.S. and teachers and therapists will be primarily Saudis. Operating hours will be in line with Ministry of Education regulations for private schools, for example from 7:30 am to 1:00 pm. The priority is for regular Saudi Aramco employee dependents. However, some places will also be open for the public.